Scooper - Technology News: What new jobs will exist in 2035? What new jobs will exist in 2035? By 2035, workplace changes will see us looking for jobs as remote pilots or online chaperones. This is the finding of an Australian report looking at megatrends in the workplace over the next 20 years. The authors of the report, CSIRO (Commonwealth Scientific and Industrial Research Organisation), outline potential jobs in 2035, along with other impacts of the Fourth Industrial Revolution on our working lives. Workplaces around the world are changing, as businesses adapt to the onset of the Fourth Industrial Revolution. Automation will see a change in the roles we are looking for, and the jobs we do. The report believes complexity will increase and higher skills will be demanded – even for entry level tasks. This will require education systems to adapt and change to equip the workers of the future with the skills they need. As the infographic highlights, the impact of automation will vary considerably. For the authors of the report, creativity is an increasingly sought after skill, while the employment landscape in 2035 will work “to the advantage of tomorrow’s entrepreneur”. Given the demographic and technological changes now set in motion, these are some of the new human-only jobs that could emerge. The rise of unmanned and un-crewed vehicles will need a new workforce of remote operators. Pilots, ship captains and drivers could all be sitting in an office, potentially thousands of kilometres from the vehicle they are controlling. While many existing skills will transfer, new skills will also be needed to fly a plane remotely. A new category of "personalised preventative health helpers" will also emerge. These workers will possess great people skills, and the ability to interpret and understand health and well-being data. They “will help their clients avoid chronic and diet-related illness, improve cognitive function, achieve improved mental health and achieve improved lifestyles overall.” As the global population ages, such a role will become increasingly important, and the report argues the growing popularity of personal trainers indicates the potential of this job. The increasing risk posed by cyber-crime will see a new profession of online chaperones. These professionals will provide protection and support for online activity. This could extend from fraud and identity theft to social media and reputation management. Finally, the report sees the demand for big data analysts continuing to expand rapidly, along with specialisation of analyst roles. The world currently creates 2.5 quintillion bytes of data a year, and the growth of the Internet of Things will see this increase exponentially. Someone has to tackle this data, argues the report. However, the authors highlight that “although change is inevitable, future destinations are not.” These new jobs are predictions, not set in stone. So if you fancy a career as a remote-control pilot, watch this space. 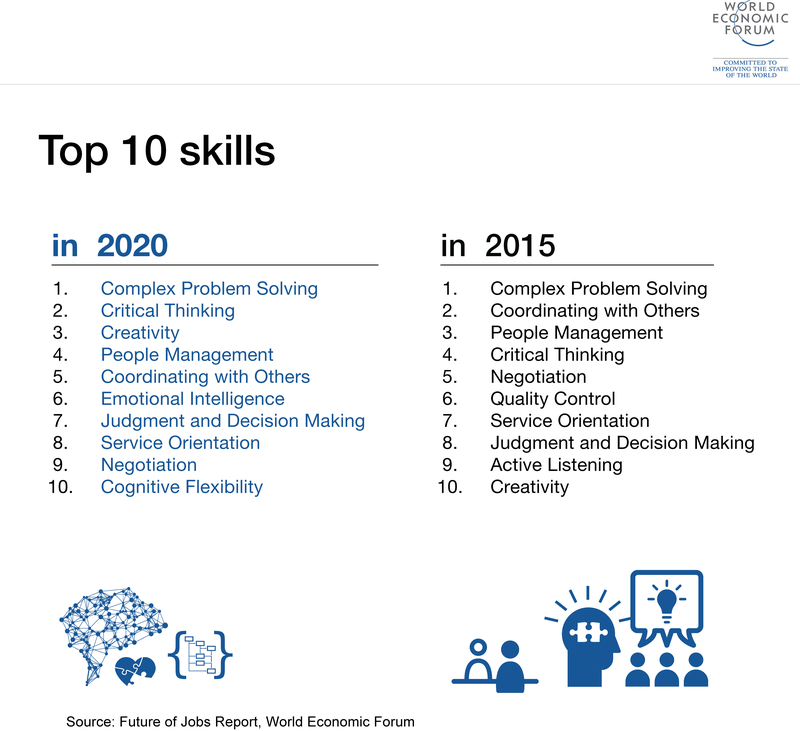 The World Economic Forum’s Future of Jobs report has predicted the skills that will be needed in a future workplace. As the following graphic highlights, these range from creativity to negotiation.